Spanish Point , 1977. 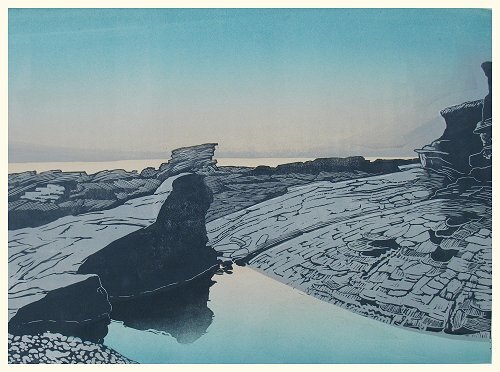 52 cm x 37 cm .3-block print on Somerset paper . Edition of 40 . The oldest of these prints . A courtship rock for us , that we called the Hump . As the weather calms down , the sea can still be boiling white beyond , long after the wind has dropped , allowing the reflection of an evening sky in a large trapped rock-pool .